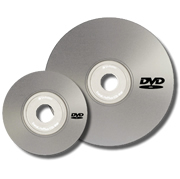 DVD-R disc duplication is the ideal solution when you need to order less than 500 DVDs. CCSS Inc. DVD duplication services has never been easier. We offer packaging solutions to accommodate your needs. Our direct-to-disc printing assures that even the smallest orders look amazing. Short-Run DVD disc duplication gives you the flexibility to meet fast deadlines, and not lose the look and feel of DVD-ROM. We pride ourselves on our quality and on time deliveries. Standard Short-Run DVD duplication orders are completed within 1-2 business days from art approval. ���If you need a larger quanity check our DVD Replication section. DVD Duplication is the process of burning data onto an existing pre-structured dye treated media (DVD-+R). This process is perfect for small quantities as well as larger quantities that require fast turnaround times. CCSS, Inc uses high quality media and R-Quest professional duplication systems to make your project a success. DVD Replication is a manufacturing process specifically engineered for DVD 5, DVD 9 and DVD 10s larger runs. This process is referred to as stamping or molding. The DVD is created by injecting polycarbonate into a die. The die was created from the glass master, which in turn was created from your master DVD. DVD Replication is used for large quantity orders, normally 500 and higher. Turn times are slightly longer than duplication in short run quantities. Regardless of the method that is right for your particular job, CCSS experience of CD DVD media technology, packaging, distribution and customer service. Your experience with us will be a rewarding one. DVD-R Duplication Turn Around Time 250 Units a Shift.